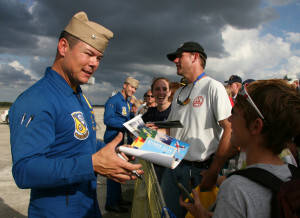 The ongoing investigation into allegations of misconduct by the former commanding officer of the Navy’s flight demonstration squadron, the Blue Angels, has revealed additional detail about the inappropriate work environment that existed two years ago. According to the investigation, Capt. Gregory McWherter, while serving as the commanding officer of the Blue Angels, tolerated an inappropriate work environment within the squadron which may have violated the Navy’s sexual harassment, hazing and equal opportunity policies. Following a complaint filed with the Navy Inspector General, McWherter was relieved of his duties as executive officer of Naval Base Coronado in San Diego Friday by Commander, Navy Installations Command. The complaint alleges that lewd speech, inappropriate comments, and sexually explicit humor were allowed in the workplace and in some cases encouraged by the commanding officer. It was further alleged that pornographic images were displayed in the workplace and shared in electronic communications. “All Navy leaders, whether assigned to a highly visible unit like the ‘Blues,’ or to our installations, squadrons, ships and submarines, are held to the highest standards. The Navy expects everyone, from those officers in command positions to Sailors on the waterfront, to provide principled and highly ethical leadership, stressing discipline, accountability, and the importance of treating shipmates with dignity and respect,” said Vice Admiral David Buss, commander, Naval Air Forces. In response to this complaint, Admiral Harry Harris, commander, U.S. Pacific Fleet directed an investigation to inquire into the facts and circumstances surrounding these allegations. The investigation team, led by a Flag Officer, is currently investigating the alleged misconduct and will submit a report upon completion of their review. “We remain fully committed to accountability, transparency, and protecting the integrity of ongoing investigations,” said Buss. – From a Navy.mil news release.